This two-part DVD set or streaming video package offers a detailed illustration of Motivational Interviewing. Based on the revised and updated Motivational Interviewing, 3rd edition (2013), this material introduces the new four-process method of Motivational Interviewing. With your purchase, you'll get more than 6 hours of video material, including a discussion between Drs. 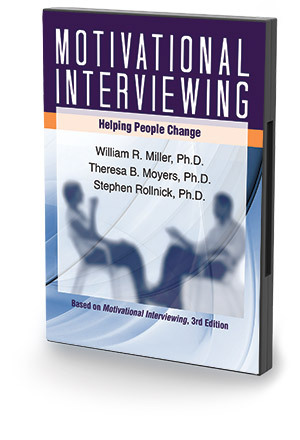 William R. Miller, Theresa B. Moyers and Stephen Rollnick, as well as 14 example interviews that illustrate Motivational Interviewing's many real-world applications. Whether streaming online or watching via DVD, Motivational Interviewing: Helping People Change comes loaded with access to downloadable resources, including a detailed menu of topics, interview commentary and annotated transcripts of all 14 interviews. Streaming access to Motivational Interviewing: Helping People Change allows you to watch from wherever you can find a reliable Internet connection. The related book, Motivational Interviewing, Third Edition, is available from Guilford Press. William R. Miller is Emeritus Distinguished Professor of Psychology and Psychiatry at the University of New Mexico. The author of more than 40 books, he introduced the concept of Motivational Interviewing in 1983, and is listed as one of the world's most cited scientists. Theresa B. Moyers is on the clinical psychology faculty and is a senior researcher at the Center on Alcoholism, Substance Abuse, and Addictions (CASAA) at the University of New Mexico. Her research focuses on understanding the change processes underlying Motivational Interviewing, and how best to help clinicians develop competence in this method. Stephen Rollnick is a clinical psychologist and Professor of Health Care Communication at the University of Cardiff, Wales, UK. His work on adapting MI for healthcare and other settings has been embraced by numerous books and papers, along with training efforts in diverse cultures and settings. How MI developed; what is unique and essential to MI; foundations and spirt of MI; direction in MI; four fundamental processes of MI; what makes counseling MI? Part II contains four hours of demonstration interviews of the four processes of MI by Drs. Miller, Moyers, Rollnick and Yahne. The 14 interviews span a variety of problem topics and practice contexts. Interviews 11 and 12 are Dr. Miller's previously unreleased original (1989) demonstrations of the clinical style of Motivational Interviewing and Motivational Enhancement Therapy. Interviews 13 and 14 are re-released with permission from the 1998 training video series. Streaming refers to the process of playing a multimedia file over an internet connection without downloading it. So long as you have a reliable connection to the internet and aren't operating behind any firewalls, streaming should not be an issue. One way to test your streaming capability is to watch a YouTube video.